I never knew hair rebonding session could eat up to 5 hours until the other day. My husband was generous enough to share his midyear moolah and sent me to a salon, alone! After the ‘jokla’ examined my frizzy locks he then say the figures that almost made me fell out of my chair. I might have gotten my mom’s genes on haggling, in the end we met an agreement on how much I’m going to shell out for a 5-hour ordeal. Lol. Unlike relaxing, chemicals used in milk rebonding are weaker and it did not damage my scalp much. I love the result, it looks so unnaturally straight though, but I prefer it than always having a bad hair day. I tried not to feel guilty in handing out my 2k at the counter; after all, I deserve a break, a salon break following all the cooking, the washing, the fetching, the cleaning, the etc.. etc… but thing with living frugal … you just can’t help it - feeling guilty after. 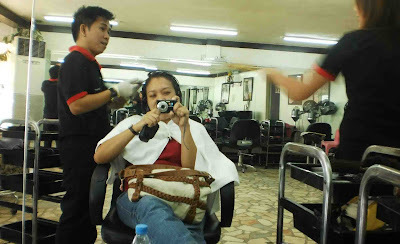 I used to straight my hair way back in Davao.and when I had my vacation last year I tried the rebonding. I never knew it was so hurt to be undergo with the rebonding though i didnt get any wounded scalp.Good for you it took only 5 hours for me 8 hours...and I pay 5k i thought they make daya to me but anyway I like the result like you said it is like natural hair. so sweet of your husband to send you on a me time! everyone deserves royal treatment once in awhile.. happy hair day!